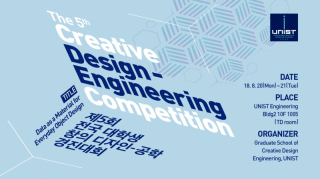 The 5th Creative Design-Engineering Competition is scheduled to be held at UNIST from August 20 to 21, 2018. Organized by the Graduate School of Creative Design and Engineering at UNIST, the topic of this year’s competition is “Data as a Material for Every Object Design”. There will be also a special lecture by President Jihwan Lee of Alleys Wonderlab Inc.